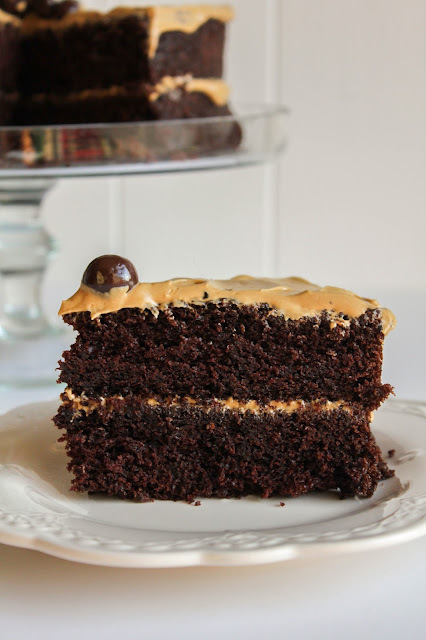 This rich and decadent chocolate cake is light and fluffy thanks to the addition of coffee! 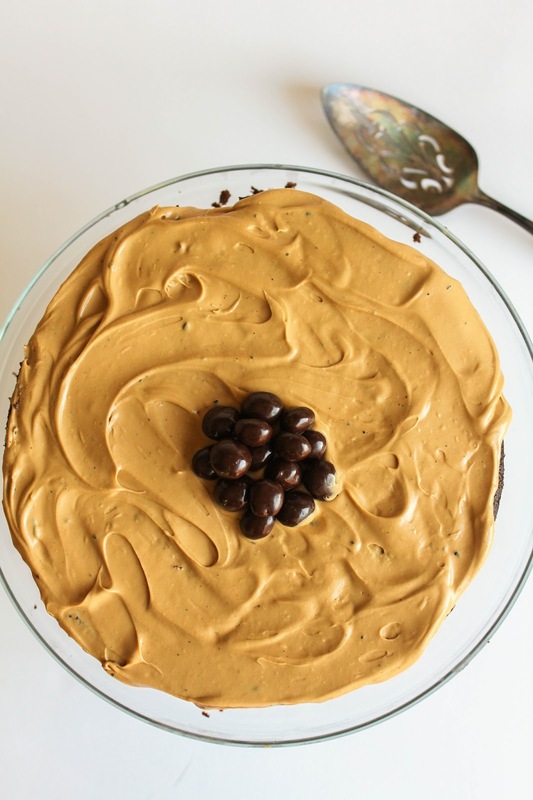 Topped with a delicious coffee frosting, you'll find yourself making this cake again and again! It's no secret that I'm a coffee addict. Everyone knows it! But did you know that in addition to drinking my coffee, I love to cook with it, too? Coffee is rich and flavorful, and can add depth to your dishes. Whether you're making something sweet or savory, it gives your dish a whole other flavor profile. 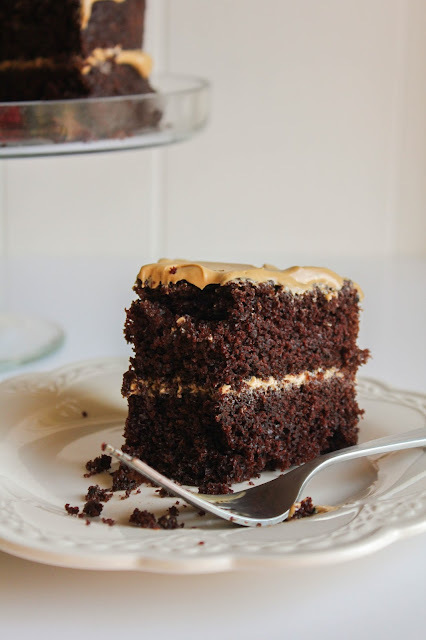 Take this Rich Chocolate Cake with Coffee Frosting, for example. Adding a cup of strong black coffee to the cake batter gives it the deepest, richest chocolate flavor I've ever had. Not only that, but it makes the cake incredibly light and fluffy. It's honestly the most tender cake I've ever made! 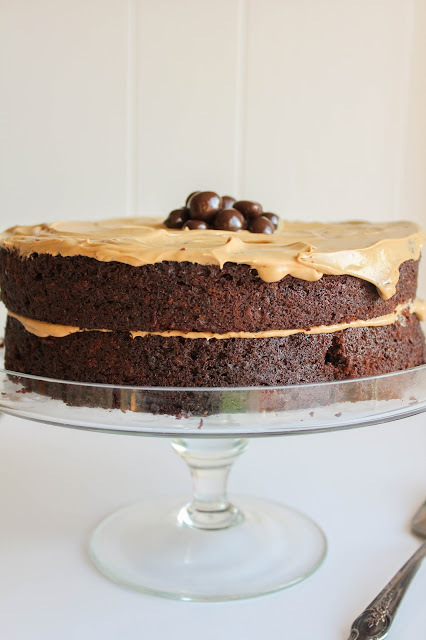 The finishing touch on this decadent cake is a light coffee frosting. It's not heavy at all, and adds just the right amount of flavor without overpowering the flavors of the cake itself. Topped with a few chocolate covered espresso beans it's not only delicious, but beautiful, too. From cakes to brownies, coffee rubbed steaks to pot roasts, there are many dishes that can be made with a delicious cup of joe. Although I already have a coffee maker, I've got my eye on the KitchenAid Precision Press! It boasts an integrated timer and scale that weighs coffee grounds and water independently in one carafe for precise ratio and brew time. It's simple to use, and gives you a rich, robust and full bodied French Press brew. I can't wait to get my hands on it! Do you have a favorite recipe that includes coffee? Share with me in the comments below. But first, let's make cake! Preheat the oven to 350 degrees. Spray two 8-inch round cake pans with non-stick baking spray. In the bowl of a stand mixer, beat the butter and sugar until light and fluffy. In a large bowl. whisk together the flour, cocoa, baking soda, baking powder, and salt. In another bowl, combine the buttermilk, eggs, and vanilla. With the mixer on low speed, alternately add the dry ingredients and the wet ingredients to the mixer. With mixer still on low, add the coffee, scraping the bottom of the bowl with a rubber spatula as needed. Pour the batter into the prepared pans and bake for 40 minutes, or until a cake tester inserted into the center of the cake comes out clean. Allow the cakes to cool in the pans for 30 minutes, then turn them out onto a cooling rack to cool completely. While the cakes are cooling, make the frosting. Pour the cream into a bowl and whisk in the espresso powder. Add the powdered sugar and whisk until smooth. 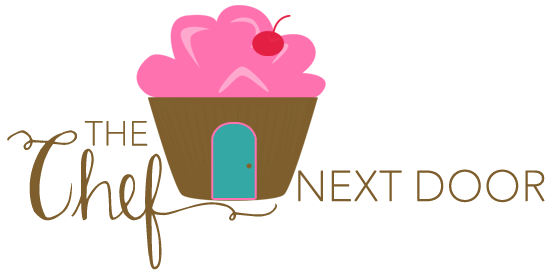 Place one cake layer, flat side up, on a plate or cake stand. With a knife or offset spatula, spread the top with frosting. Place the second layer on top, rounded side up, and spread the frosting evenly on the top of the cake, letting some run down sides. Top with a few of the espresso beans, right in the center. Slice and serve. This post is Sponsored by Single Edition Media on behalf of KitchenAid, however, all opinions are my own.